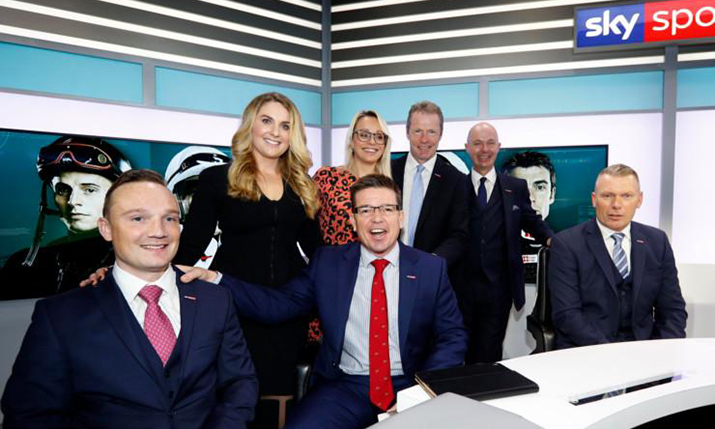 Sky Sports has added a host of production, presentation and technology enhancements to Sky Sports Racing as it looks to bring the horse racing channel formerly known as At The Races in line with its other live sports channels. 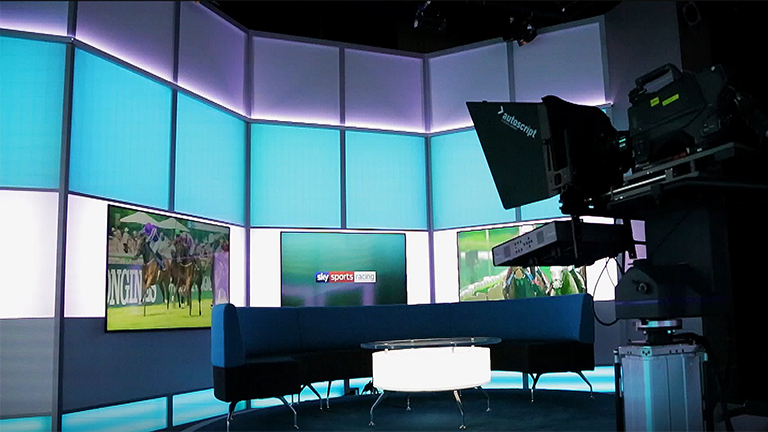 Now part of Sky’s genre line-up that includes dedicated channels for football, cricket, golf and F1, the horse racing hub is being given an overhaul that includes the addition of studio automation, drone cameras and touchscreen technology and a move to HD. They also follow a subtle change of ownership. A long-term partner and investor in At The Races, Sky strengthened its involvement in the channel in 2017 by becoming the majority shareholder, purchasing additional shares from partner Arena Racing Company (ARC). Although Sky now majority owns At The Races, the company behind At The Races continues to operate the channel with Sky Sports acting as the production partner. The -revamped channel went live on 1 January 2019. The new name and new majority owners are not the only changes. And one of the technological enhancements was a bit of no-brainer, as Rob Dakin, At The Races director of broadcast and head of channel, Sky Sports Racing told SVG Europe. The move was made possible because the race coverage itself had gone HD with technical and broadcast services firm RaceTech now providing all UK race feeds in HD on behalf of ARC. At each of the 25 racecourses that the channel covers, there have been other additions too. A fixed high-motion camera has been added for ‘across the line’ finishes. Two live cameras are now positioned on the finishing straight: a close and a wide. The close camera has super slo-mo capabilities to allow for replays and analysis. An RF camera that can be used for presenter pieces to camera or for additional race coverage is also part of the armoury at each track. For flat racing, a side-on camera has been installed to the show the start of a race. “One of the key objectives for us was improving the standard coverage of all of our races, not just the bigger fixtures,” said Dakin. “We wanted to raise the bar for every fixture on the channel. For those bigger fixtures, and for some other selected races, a drone camera and a tracking vehicle, fitted with Aerial Camera Systems technology, will be used. Importantly, both will be used in a discerning way and not just for the sake of it. A drone was used at Plumpton for coverage of the Sussex National Handicap Chase in January, for example, capturing parts of the course that other cameras couldn’t reach. “At Plumpton, on the positions on the race course where we felt that the coverage could be improved, we used the live drone,” explained Dakin. Cameras won’t be the only additions for bigger meetings. At the Chester May Festival, Royal Ascot and the St Leger Stakes, Sky Sports Racing will bring in additional reporters and the focus of the presentation will move from the studio to the racecourse. Later in the year, the production team will also look to roll-out the Sky Pad, as used on Sky Sports’ F1 coverage. The touchscreen technology will be used for presentation and analysis. “We want to be in the position where we can bring jockeys and trainers over to the Sky Pad and allow them to explain to us how a race has developed,” revealed Dakin. For what is a very analytical and stats intensive sport, on-screen data will also be crucial for Sky Sports Racing. “Sky has developed a back-end that can take in all the raw data feeds, whether they are domestic or international, aggregate them and then present them for broadcast,” continued Dakin. Data usage can go much further than simply showing the form of the runners and riders. There are a number of ARC courses where live in-running data is available, provided by Total Performance Data, using information taken from a microchip housed in the saddle cloths of the horses. “We currently provide that as a live section on some of our racetracks to provide us with live sectional time data,” he explained. While the addition of HD, more camera angles and increased data and analysis will benefit the output (and the viewer), perhaps the biggest (and most complicated) change is happening back at Sky in Osterley. Here, a new studio and production gallery have been built that make use of automation. Built around the Ross Video Overdrive system, the studio has four robotic cameras, including two on rails. These can be programmed or operated remotely by the technical supervisor in the gallery. Although Sky News has been using automation for some time, the move means that Sky Sports Racing is the first live sports channel at Sky to work this way. Dakin feels that there are lots of parts of the channel’s schedule where they can benefit from automation. “The obvious assumption people make is that automation is about saving headcount,” he said. “For us, it wasn’t. We’ve always been very lean. We felt it was an opportunity to improve workflows and provide a better output with our existing headcount. “When we have a busy afternoon of racing, we have someone in sound but there are parts of our schedule where the sound is automated which means we don’t need a sound person. We can effectively run our output with just a producer and a director. That is very lean. But for the big events, we will staff it in a more traditional way. Importantly, automation provides Dakin and his team with flexibility in how they resource the channel. Although there are benefits (and more to come), the introduction of automated systems has not been completely plain sailing, he admitted. 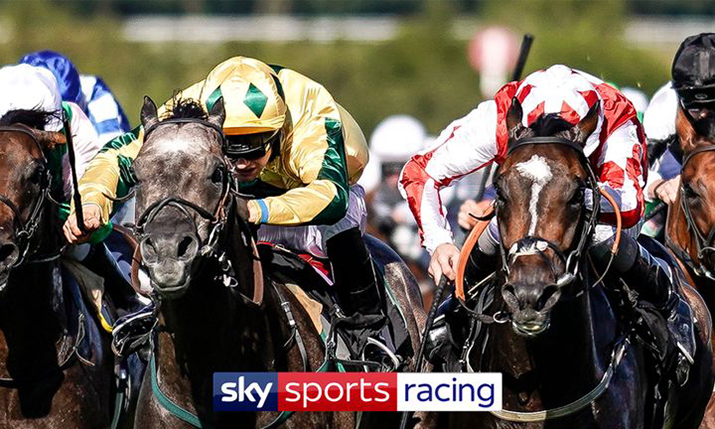 In 2019 Sky Sports Racing will provide live coverage of over 700 UK fixtures from 25 courses, including Ascot, Chester, Lingfield and Doncaster, plus more than 200 fixtures from France and over 80 from Hong Kong. There is also daily coverage of live racing from the US and Australia.